The Phoenix suite of products offers world class restoration tools for the most demanding jobs, and features our multiple award-winning DVO technology. Phoenix is designed to produce great results fast with less manual intervention. With a familiar timeline based interface, the artist and archivist can easily review and retouch defects in context as required. Using the Phoenix film and video restoration solutions with its award-winning DVO image processing software tools, means you never have to compromise on image quality. With automated and semi-automated file-based restoration features for greater operator efficiency, the only decision to be made is which product provides the right level of functionality for the task in hand. An end-to-end solution that includes Digital Vision’s leading image processing DVO toolset. Phoenix Video is a highly automated restoration and enhancement solution for handling video content stored on tape formats such as 1¨, U-Matic and Betacam SP.. The system handles common image defects such as dropouts, severe noise, cross colour artifacts, line sync problems and more. Additional features include motion compensated frame rate conversion and high-quality upscaling, as well as full support for common broadcast codecs. DVO Twister for sophisticated motion-compensated frame rate conversion. 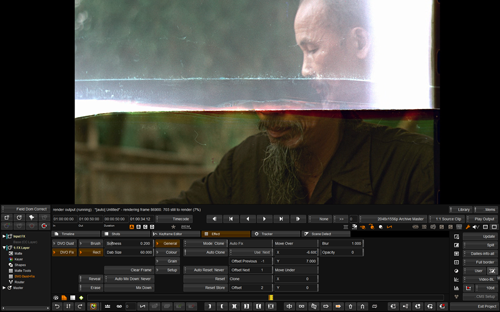 A cost effective image restoration software, aimed at film based material and for cleaning up VFX plates and DI scans. Phoenix Touch contains powerful automatic dust-busting capability alongside a high quality manual repair toolset that can turn around intensive repair tasks quickly. Phoenix Touch can also act as assist station to Phoenix Refine and Phoenix Finish. The best high-end restoration toolset for repairing damage to film material. 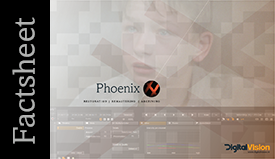 Combining the best in automatic, semi-automatic and manual restoration tools, Phoenix Refine adds editorial and effects processing capability. The result is a single system with outputs for both mastering or archive. 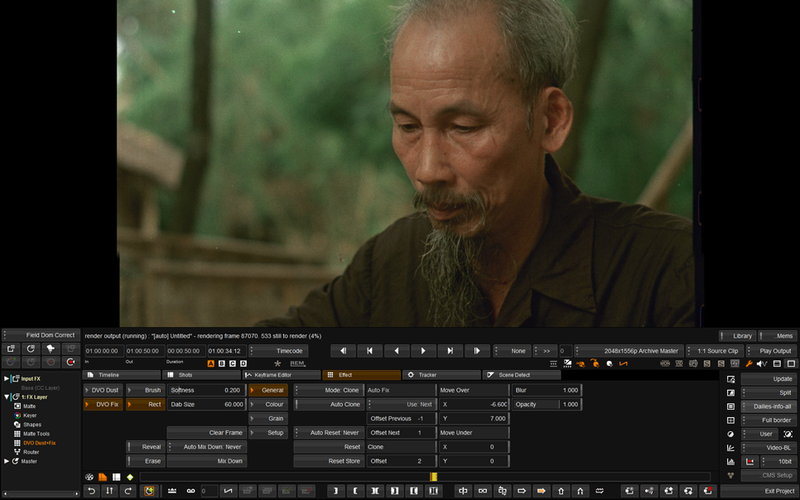 The normal approach for film restoration is to address global issues (i.e. problems affecting the whole image such as unsteadiness or flicker), then tackling localized defects and finally and optionally enhancing the image. Unsteadiness is first removed using the automated DVO Steady, in combination with correcting any splice bumps. Then flicker (including chroma breathing) is reduced with DVO Flicker, also automated. Once the global issues have been addressed, tram lines can be removed using DVO Scratch. The typical time-consuming dust-busting process is done swiftly with the motion compensated DVO Dust, optionally complemented with manual DVO Fix. DVO Fix to touch up, either using “include” or “exclude” modes. Although most of these processes are automated, the operator can override them and fine tune for an even better result. Finally a bit of gentle grain reduction using DVO Clarity and some sharpening using DVO Sharpen can be added for that extra crispness. Both Phoenix Refine and Phoenix Finish are suitable for this type of work. In addition to the above, old and severely damaged film may need additional treatment. The complete range of tools may need to be used and Phoenix Finish is the best choice here. For example, frame reconstruction can be done in a number of ways, with a motion compensated “fill-in” using DVO Fix. 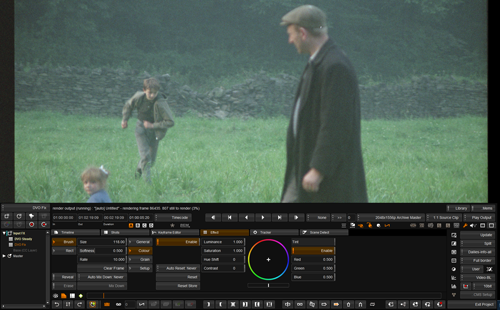 Time stretching can be achieved with DVO Twister, using multiple layers/tracks and compositing tools. Colour/density matching can be performed using the advanced grading tools available in Phoenix Finish. The negative, parts of a print or even material previously put on tape can be used to match to the negative by image enhancement such as using DVO Sharpen, DVO Clarity or DVO Grain. Image resize/positioning is achieved using Pan & Scan or DVO Upscale. problems, if present, like patterning need to be addressed first. Patterning can usually be resolved by sharp cut-off low pass filtering using the generic DVO Brickwall or DVO Alias tools. Digital dropouts can be removed using DVO Dust – a very versatile tool that can remove almost any type of random artefacts, both field or frame based. Digital noise is finally reduced by DVO Clarity. It is not unusual that different camera types are used in the same production, with different types of noise being induced. With DVO Clarity these different shots can easily be matched. Start by correcting any “line-start” problems using DVO Line Sync and then composite artefacts can be eliminated with DVO Cross Colour. One of the biggest issues with material on analogue tapes is dropouts. Use DVO Dropout to take care of this. Larger defects can be removed manually with DVO Fix using its motion compensated fill-in. Video tape noise is typically also a big problem, but can be dramatically reduced with DVO Noise. This has separate luma/chroma controls, to influence the chroma channel more strongly. To make the final product look pristine, sharpening (DVO Aperture) can be added. Are there any mixed film/video related defects? No problem, film and video restoration tools can be mixed to restore the content, matching it to the original capture.